Magnolia stellata with its pure white flowers is one of the smaller growing deciduous magnolias. Reaching around 3m, often less, it is an excellent choice for smaller gardens. Flowers appear on bare stems before the foliage. The flowers open a pure white, they are fragrant and will almost cover the shrub during spring. This is a slow growing variety, readily available in sizes from 1 – 2m tall. Over time it will branch out to form a good rounded shrub. The deep green foliage is attractive through summer to autumn. Best grown in a humus rich soil, afternoon shade and with plenty of mulch applied in spring to help maintain moisture and a cool root run through summer. Best in a slightly acid soil Magnolia stellata is a hybrid of M. kobus, from norther Japan. So sometimes seem as Magnolia kobus var. stellata. Pruning is generally not required. 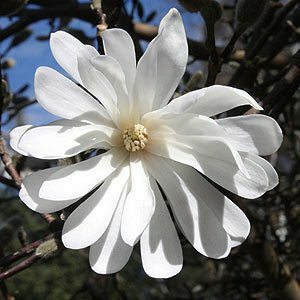 Magnolia stellata is suited to growing in containers, use a good quality potting mix and a general purpose fertilizer to maintain vigor. Height – Will reach around 3 metres (9 ft) depending on conditions. Flowers – White and star shaped. Flowering Time – Early spring. Foliage – Deciduous, glossy deep green from spring through summer. Position – Full sun to part shade, afternoon shade in warmer climates. Soil – Humus rich, well drained and slightly acidic. Mulch – Yes mulch around the plant to maintain a cool root run. Pruning – Generally not required except for removal of damaged or dead limbs. Prune after flowering.